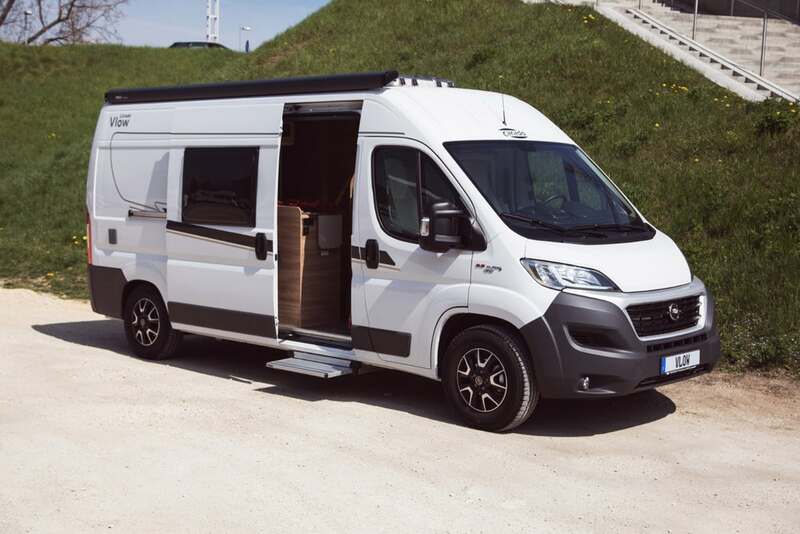 The Erwin Hymer Group has sure been busy lately; not only have they been launching the Carado Axion and making waves in the North American market, but they’ve also been preparing to launch the Carado Vlow in the European market too. However, besides the name, you won’t find many similarities between the two campers, as they have been created for two fundamentally different types of customer. While the Axion is designed to sleep two people, the Vlow can sleep up to five, and haul bikes and gear as well. The Carado Vlow is ready to take up to five people on an adventure. Unlike its American cousin the Axion, the Vlow camper comes in a variety of different layouts, depending on your needs. They can sleep between two and five people with different bed layouts being either lengthways or widthways, but all feature the same bathroom and lounge area set-up. 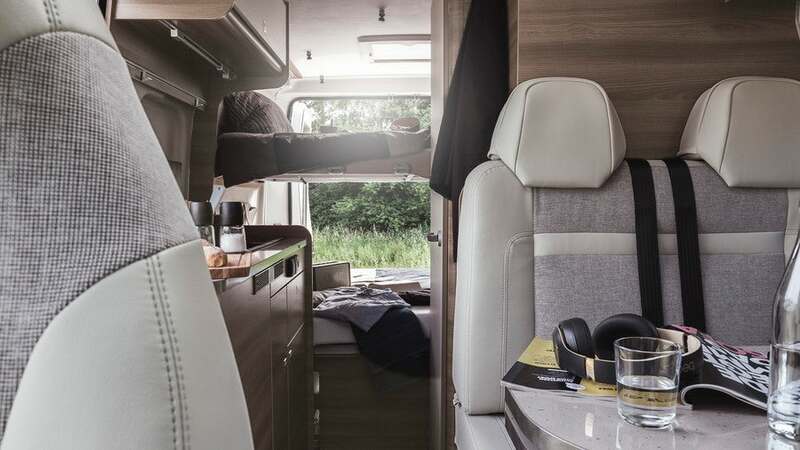 The V600 and V540 both sleep two people on a rear transverse double bed, while the V640’s longitudinal bed creates more cupboard storage space at the rear; all three have the ability to sleep an extra third person by converting the lounge area into a central bed. 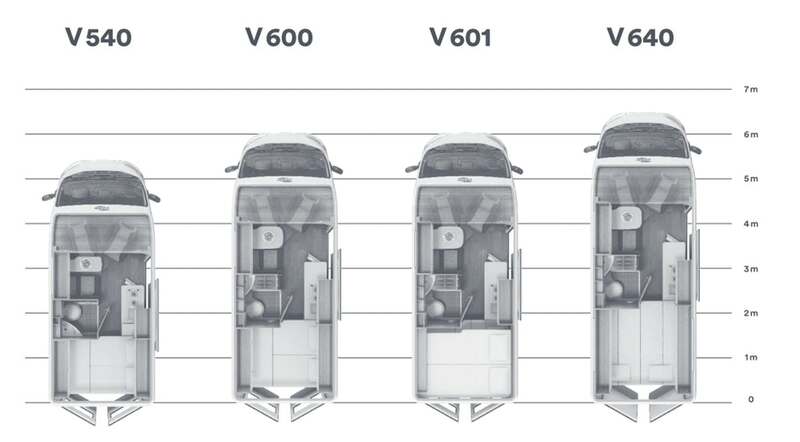 But the model we’re most interested in is the V601, which carries four people and their bikes by day and sleeps an impressive five people (minus the bikes) at night, using a clever set up of differently sized double bunk beds at the rear and that all-important convertible bed at the front. The differences in size and layout between the Vlow models. 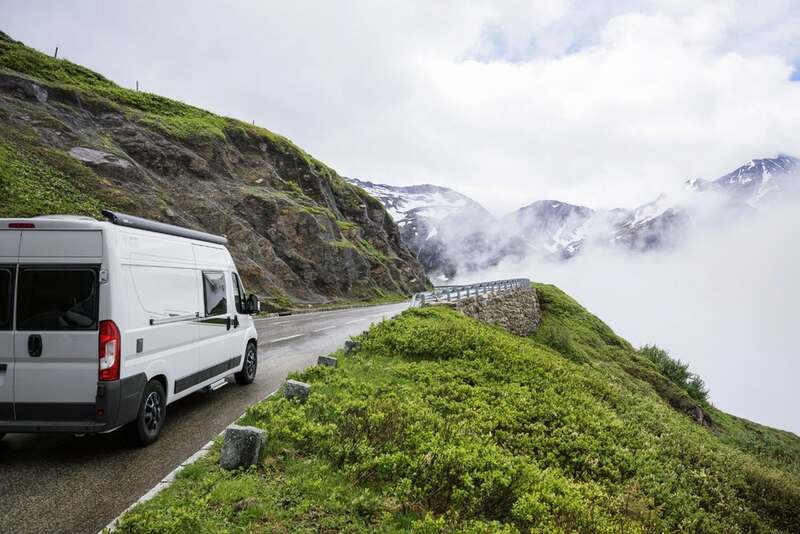 The base van that houses all of this wonderful innovation is a humble Fiat Ducato, with a 129bhp 2.3L Multijet engine and six speed gearbox, with the option of upgrading to a 174bhp engine. This has been hailed as one of 2018’s safest and most powerful vans on the market, and it’s easy to see why. It’s got Electronic Stability Control, a Lane Departure Warning System, Traffic Sign Recognition (the ability to read and reproduce road signs on the van’s 5” display screen), high beam recognition (automatically dips your headlights for oncoming drivers), and rain and dusk sensors for automatic headlights and windscreen wipers. Optional extras include Traction+ with Hill Descent Control, rear parking sensors, and a chassis package with AC, cruise control and a passenger airbag. The Vlow also comes with a Thule awning and foldaway entrance step below the side door. 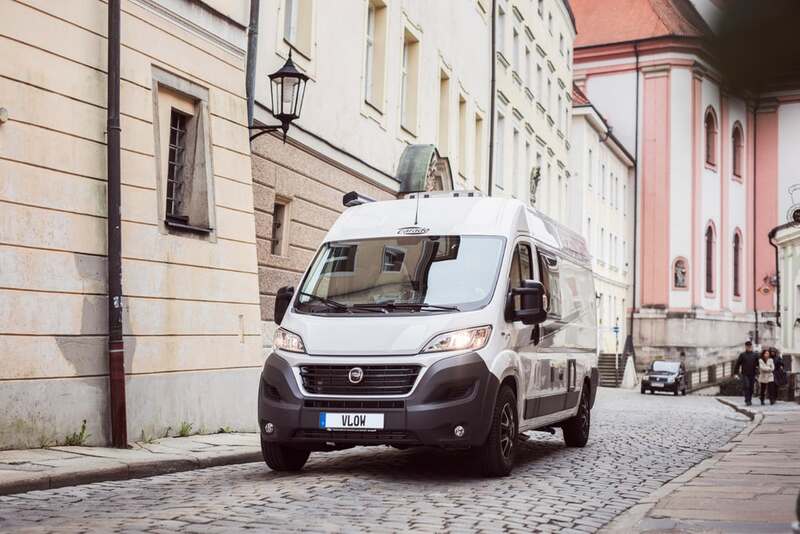 The Vlow’s base van is the high-tech modern Fiat Ducato. Moving indoors, the interior is sleek, modern and stylish, with warm wood tones complemented by white cabinets. The seats are available in either Explorer or the lighter Arctica upholstery, and a large skylight provides light to an otherwise tight space. A twin bench seat and two front swivel seats create a central living area around the table. 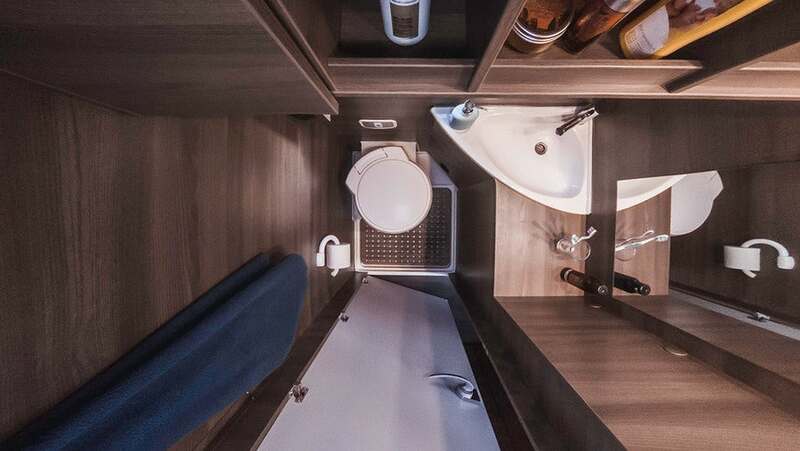 The Vlow also manages to pack in a surprising amount of storage space- above the cab, under the rear bed, and with cabinets at the front and rear; it even manages to squeeze in space for a hanging closet between the bathroom and lounge. The light upholstery and warm wood creates a lounge with an airy feel. 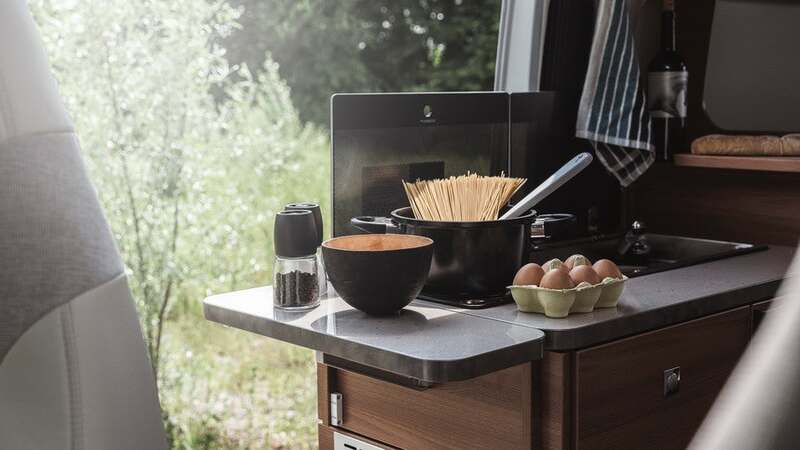 Along one side of the van you’ll find the long, narrow galley kitchen covering half of the sliding door entrance, containing a dual burner and sink with glass tops and an extendable countertop. All of the models feature a 90L fridge/freezer apart from the V540 which features a smaller 65L fridge, and the number and layout of cabinets also varies by model. Cooking with a view; the Vlow’s kitchen overlaps the side door entrance. Opposite the kitchen sits the wet room, which rather resembles an elegant hotel bathroom with polished dark wood and modern white fixtures. It’s got a toilet, a corner sink and a shower with shower tray built into the floor. This is fed by the Vlow’s 100L fresh water tank and collected in 90L waste water tank. Inside the van is heated by a Combi 4 heater, and 230V and 12V outlets provide charging points for phones and laptops, powered by a 95Ah leisure battery. What the wet room lacks in space it makes up for in style. The Carado Vlow is available for a range of prices depending on the model, with the lower end being the V540 at €35,499 ($40,420) and the scale topping at €37,999 ($43,315) for the V640. The aforementioned V610 sits in the middle at €36,999 ($42,120), almost half the price tag of its American counterpart the Axion, which only further emphasizes the vast gap between the two very different types of market.